Crossland High School is a comprehensive high school dedicated to preparing students to be productive citizens in the 21st century. The school consists of a traditional program and a Technical Academy, designed to provide students with marketable skills in the areas of cosmetology, drafting, welding, nursing, horticulture, masonry, air conditioning refrigeration, printing and culinary arts. "The Best Possible Service to the Community"
All initiatives are written with this in mind. We strive to motivate our students to achieve academic excellence, and we celebrate their excellence publicly and proudly. The father of George Calvert, first baronet of Baltimore, was Leonard Calvert, a country gentlemen of Yorkshire. He married Alicia Crossland, daughter and heiress of John Crossland, another Yorkshire gentlemen. Both families were of the class entitled to have arms. The arms of the Lords Calvert and Crossland, quarter the family arms of Calvert with the family arms of Crossland, form the Maryland State Flag. The design of the Maryland Flag consists of the arms of the Calvert family quartered with the arms of the Crossland family. The Calvert family was that of the Lords Baltimore, the first Lord, George Calvert, being the founder of the colony of Maryland in 1634. The Crossland family was that of the first Lord's mother. As she had no brother and so was the heiress of her family estate, she was permitted under heraldic law to quarter her arms with those of her husband. Reading horizontally from the top of the staff, the first and second quarters are the Calvert and Crossland arms, respectively. 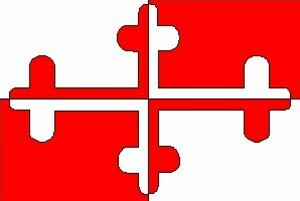 The Crossland arms are quarterly, argent (silver) and gules (red), and a cross bottony counterchanged. In flags the color silver is represented by white. 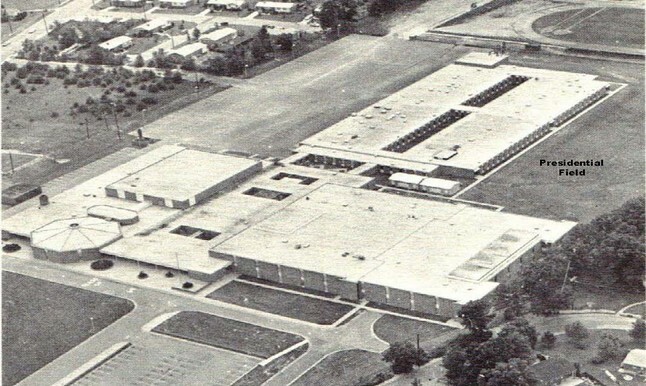 Crossland High School grew out of Federal support for vocational education that began with the Smith-Hughes Act of 1917. The Smith-Hughes Act firmly supported the notion of a separate vocational education system and support courses offered by vocational schools. The act called for specific skill training, focused on entry-level skills, and helped establish separate state boards for vocational education. By the 1960s, the vocational education system was firmly established, and Congress recognized the need for a new focus. As a result, the 1963 Vocational Education Act aimed at strengthening and expanding vocational education, while still supporting the separate system approach by funding the construction of area vocational schools, broadened the definition of vocational education to include occupational programs in comprehensive high schools, such as business and commerce. On April 27, 1967, President Lyndon Baines Johnson dedicated the Crossland Vocational Center, in Camp Springs MD, on April 27, 1967. I was a high school junior. While marking the 50th anniversary of the Smith-Hughes Act, a charter pledging federal support for vocational ...President Lyndon Baines Johnson dedicated the Crossland Vocational Center in Camp Springs MD and marked the 50th anniversary of the Smith-Hughes Act of 1917. More than forty years ago, President Johnson visited Crossland High School. It was the spring of 1967, and the Vietnam War was raging. President Johnson stepped out of a helicopter parked in a field on the side of our high school, the Crossland student body had no advance notice and there was no early press release of the president’s visit. However, when Secret Service agents appeared on the roof of the school the students and faculty knew rumors about the importance of the guest were true. Words are forgotten but inspiration lives on. Students in attendance on that day may not remember President Johnson’s remarks but they will never forget his visit or why he was there. Nov 8, 1964, New U.S Funds Will Further Area Vocational Work The vocational education picture in the Washington area is expected to change gradually, over the next three years, due to recent federal legislation…. Jan 27, 1965, Prince George’s County Ask to End night Football, High schools in Prince Georges County would play no night football games and would be limited to a nine-game season under a policy recommended yesterday to the Board of Education by Superintendent William S. Schmidt. Oct 31, 1965 Marie Mulder Dreams Of Gold Strike in Mexico, At first glance, appears no different from any of the soda-swilling, jumper clad teen-age girls in Class 10-J at Crossland High School. 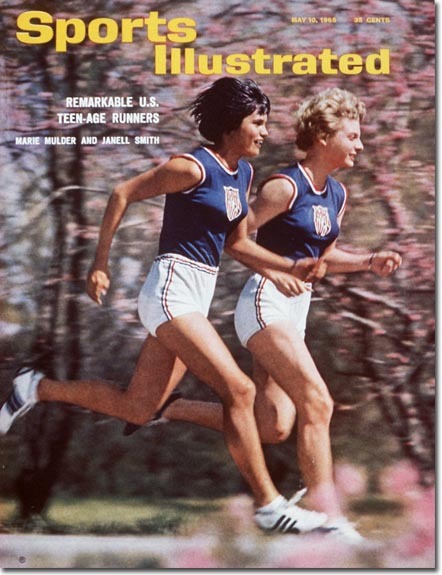 Jan. 23, 1966, Marie Mulder Won at LA Invitational, Fifteen-year-old Marie Mulder, A student at Crossland High School in Camp Springs, Md., won the women's 880-yard run Saturday night in the Los Angeles Invitational track meet. May 21, 1966, Crossland High School Wins at Maryland AA Track Meet, Without individual standouts but with consistent scorers, Crossland won the Maryland State Class AA track and field championship at Overlea High School today.